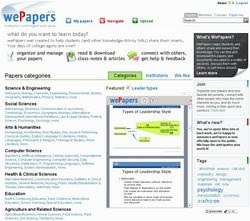 Academic material from the world's leading universities is offered by wePapers.com that is a new Israeli startup. It will be a knowledge-sharing platform for students and lecturers for free. How it works? It is a web application. It is like an online study group, and serves students and professors alike. Users are able to download and view thousands of academic documents from world leading universities such as MIT, Hebrew University and UCLA, varying from lecture notes to peer-reviewed articles, view movies right inside their browser, read documents and presentations. One of the most valuable features of service is that it filters out content by institution, language, subject to provide only quality academic material, and help users get the specific information they're seeking much faster. Co-founders Hanan Weiskopf (25) and Ehud Zamir (26) say: "Our top mission is to help students share their knowledge, learn from others and ace the agonizing world of academic studies. We want to allow knowledge to run freely in the world -- and provide resources for those who can't afford going to college." "We are both BA students ourselves. In fact, this is how the whole idea got started -- from our own experiences in college." Columbia University’s associate professor Dr. Richard Jaffe joined Weiskopf and Zamir in 2007 in prder to develop the website so that it would fit the needs of students and professors alike. "We're trying to create an environment where students can study in groups online, but also to allow them to learn from material from other institutions around the world. We hope we can make a difference in the way the world acquires knowledge."